Don’t wait hours for soup to be ready! 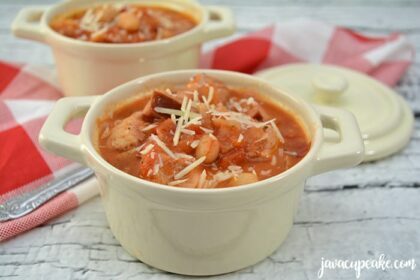 This recipe Instant Pot Soup with Pork, Smoked Sausage and Beans is ready in 45 minutes and is the perfect dinner on a cozy fall night! I don’t know about you, but on a week night I loathe cooking dinner. By the time 5:30 pm rolls around, I’m tired, the kids are tired and my husband isn’t even home from work yet but dinner has to be started! Instant Pot Soup is the best solution for those nights you just don’t want to cook! 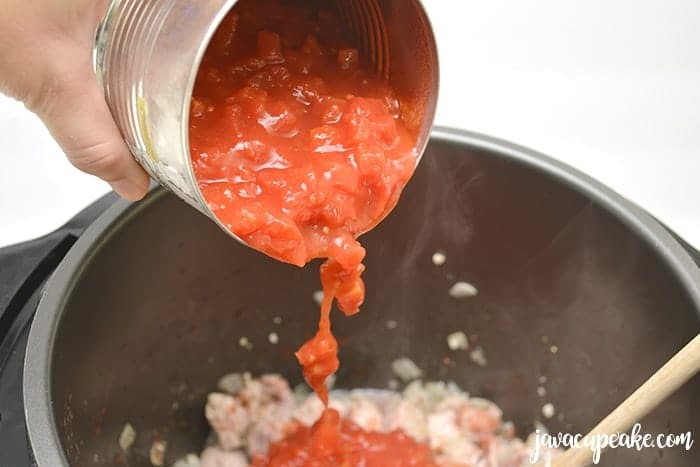 One of my favorite parts about this Instant Pot Soup is that the pork is precooked and the tomatoes and beans come ready in a can. All I need to do to prep this meal is saute the veggies and dump the rest in the Instant Pot! A few minutes of prep and only 30 minutes of cook time, this Instant Post Soup with Pork, Smoked Sausage and Beans is my go-to dinner on a cold Fall night! 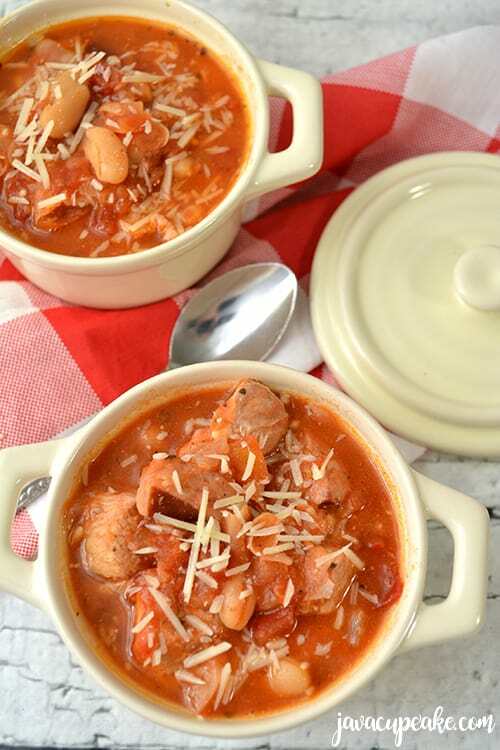 The pork, smoked sausage and beans are hearty and the broth is full of flavor. I love taking a big piece of crusty bread and soaking up the broth. To be honest though, this is the first Instant Pot Soup recipe I’ve ever tried. 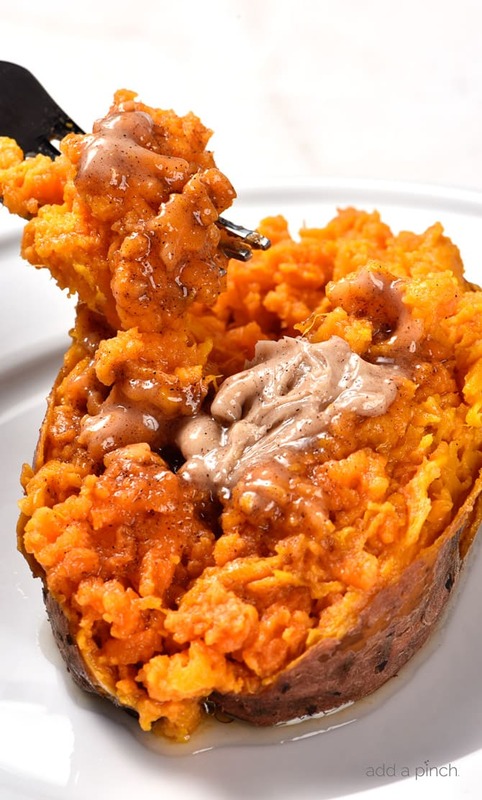 In fact, this is the first Instant Pot recipe I’ve ever made period! I know, crazy, right?! How I have survived this long without an Instant Pot? 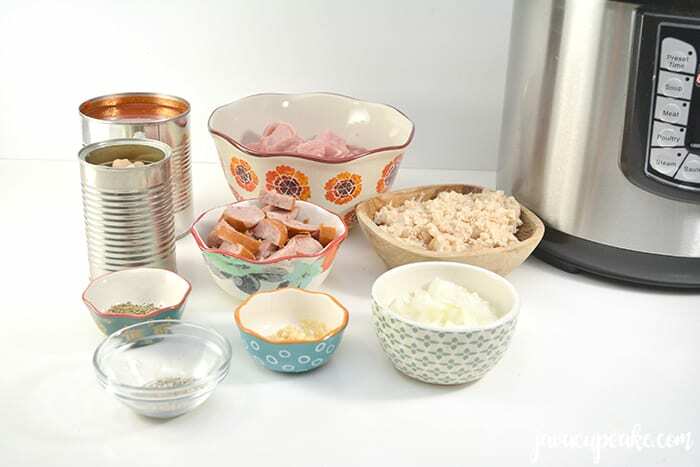 TJCB recipes to try as Instant Pot Soup! Now that I have this Instant Pot, I think I need to reinvent my favorite JavaCupcake soup recipes to make in the Instant Pot! 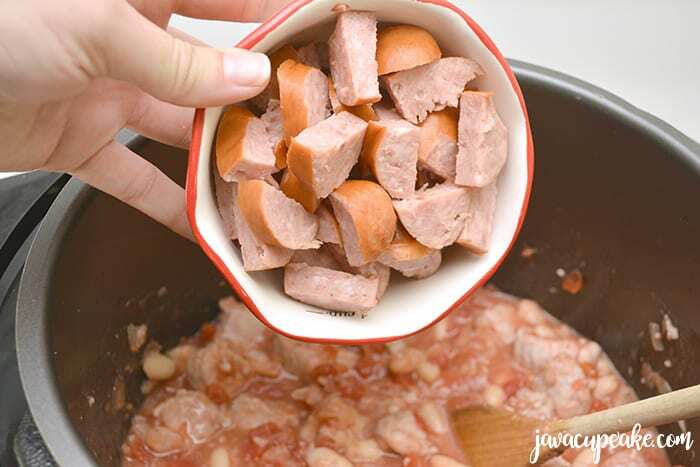 Below you’ll find my recipe for Instant Pot Soup with Pork, Smoked Sausage and Beans. Let me know if you try it… I’d love to hear what you think! 1 15 oz. Can Cannellini beans rinsed, drained and mashed. Set the Instant Pot to saute. Add 1 tablespoon of olive oil, and saute the chopped onion for a few minutes until it begins to soften. Mix in the minced garlic, and stir to combine. Place 1 pound of boneless pork roast into the Instant Pot, and saute for several minutes until it begins to brown, stir often. Sprinkle in the salt, pepper and Italian seasoning. Mix the ingredients well. 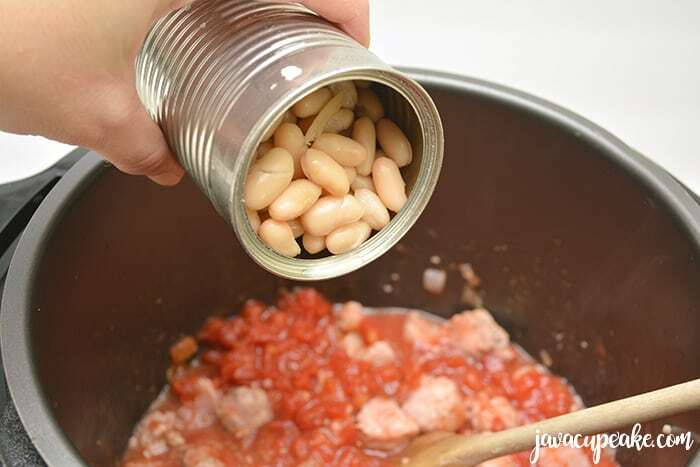 Add in 28 ounces of diced tomatoes and one can of rinsed and dried cannellini beans. Mix in the can of mashed cannellini beans. Pour in ½ cup of chicken stock. Add in a half pound of smoked sausage and stir to combine everything completely. Place the lid on the Instant Pot, make sure the vent is in the closed position, and set it on the “Soup” setting for 20 minutes. 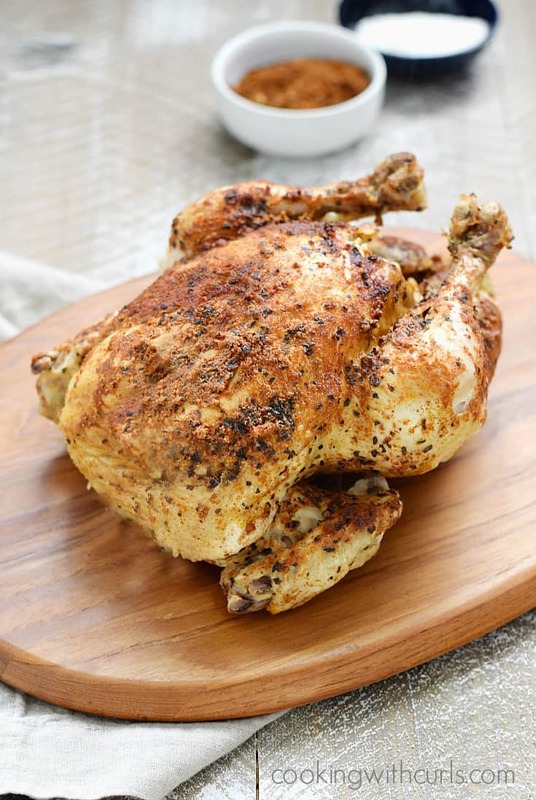 Let the Instant Pot slow release for 10 minutes, and then do a quick release to relieve the remaining pressure. Take the lid off, and stir, letting it cook on saute to thicken further if needed. Serve hot topped with fresh Parmesan and chopped parsley.